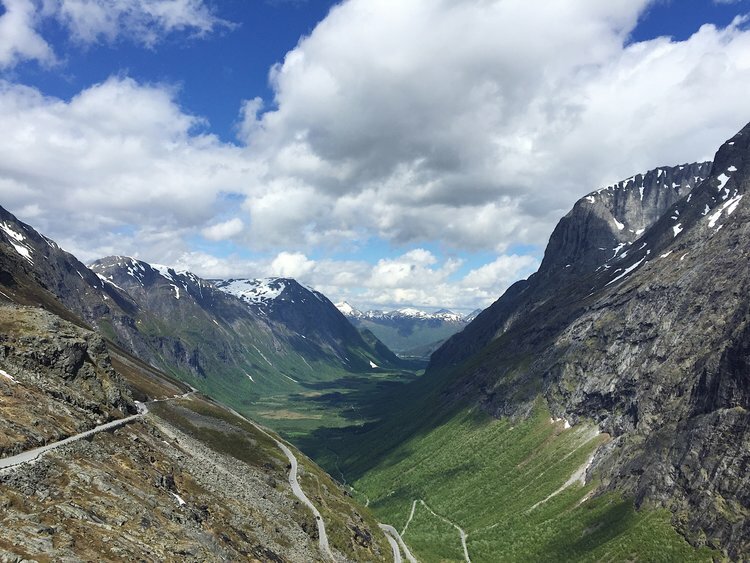 In June, my roommate and I took a trip—rather on a whim (we booked it in April)—to Norway, the land of fjords and summer snow-capped peaks. The reason: we found a cheap flight to Oslo out of Boston for $369 roundtrip on Norwegian Air. One Google image search of Norway was enough to convince us we. must. book. this ticket. And book it we did one day later. As far as budgeting goes, Norway ended up landing right (I'm so sorry for this pun I'm about to throw down…) on the money: I budgeted $1500 and it ended up costing almost exactly $1500. This is a relief given I was low-key panicking about how in the world I was going to save up enough money for this trip in just 2 months (this is how I did it). Below is a breakdown of my expenses for one week in Norway. Many of the expenses listed are the price after I split it with my friend (i.e. Airbnb, car rental, etc.). This also does not include the $100 spent during the extra day we had in Boston prior to leaving for Norway. To see our itinerary & photos from our trip, see my Norway Travel Journal. This trip would’ve never happened had Norwegian Airlines not offered such an insanely-low price to Oslo. And using my Chase Sapphire Preferred credit card, I was able to book my flight from Nashville to Boston on Southwest with points, so I only had to pay a $5.60 booking fee. Seriously, you need to own a travel credit card. I saved around $150 on this trip alone thanks to my credit card points! The only time we took a taxi was for our one-day stay in Oslo to get to and from the train station and then around the city. Taxi prices were pretty average for a large city. We had to cross a fjord 3 times with our car—sometimes, this is the only way to get to your destination in western Norway where there are fjords galore. The crossings can be pricey; fortunately, ours were shorter trips for only about $15 each, and then we were able to split that price between the two of us. Guys, the second leg of the train journey from Dombås to Åndalsnes on the Rauma Railway is DOPE. Straight-up some Narnia ish right there. Though there are tourist buses and other options available, it was well worth it to be able to explore the area at our leisure. Alas, we did get a nail in our tire (we may or may not have driven on it for several days through the mountains before realizing this), so we did have to pay to get it patched. Still, $300 for a week wasn't an awful price to pay for the freedom to drive through winding mountain passes on our own terms while listening to moody melodies. We rented our car in Åndalsnes from Hertz. Let me extol once again the benefits of owning a travel credit card. Because of points I had on my Barclaycard, I was able to apply a $75 travel credit to my Airbnb total, bringing my portion of our stay to $220. Also, you gotta see pictures of the mocha-painted farmhome we stayed in during our time in Åndalsnes and Isfjorden. We had been told that Norway was expensive prior to our trip. But when it came to train tickets and other expenses like Airbnb, it seemed like the country’s prices were on par with most European countries. HOWEVER, that was not the case with food. A simple meal of a main dish and a coffee could cost you well over $30. You’re looking at close to $20 just for a glass of wine. Yikes. For this reason, we only ate out sparingly: just three sit-down meals plus two meals at the airport (lookin’ at you, Joe & the Juice); but even then, my eating out total reached a hefty $130. For all other meals, we bought groceries and cooked in our Airbnbs (and ate way too many granola bars that we had brought along from the States). We rented kayaks for 3 hours in the stunning Geirengerfjord from Active Geirengerfjord for a little more than $50 and then paid the toll to drive up to the peak of Dalsnibba for $7.71 each after that. Both expenses were SO WORTH IT, and I’d encourage you to do the same if you are ever in that area of Norway. $1500 for a week in Norway isn’t too shabby. You could cut down those costs by not renting a car, but honestly, I think that extra expense is worth the freedom to travel at your own pace. Being able to spend a slow morning in our cozy farmhome in the mountain valley was absolutely worth not having to race to catch a bus at a specific time. Norway is pure magic, and I highly encourage you to add it to your list of places to go! Fly cheaper with these 4 tools to find the cheapest flight. Get closer to your next free flight with these 7 ways to earn airline miles. If you want to travel more, you need a travel credit card. You CAN travel on an entry-level salary. Here are 5 tips for traveling on a post-grad budget. I recently spent a week in the fairytale that is Norway, land of fjords and mountains and all that is beautiful in the world. Here's a breakdown of my $1500 budget: from flights, to transportation, to food, to everything else.